Let’s assume that you love ice cream and you are about to eat some. How sure are you that what you are about to put in your mouth is really ice cream? Perhaps you are wondering what else it could be when it looks the same, comes from the same freezer and the same brand? It could be something called a frozen dairy dessert. 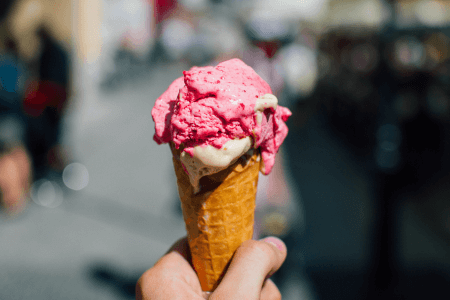 Read on to find out what the differences are between ice cream and a frozen dairy dessert. Ice cream is a frozen semi-solid food made from milk and cream, often with fruit or other flavors. It is sweetened with sugar or artificial sweeteners and whipped to incorporate air when it is made. It is always cooled below the water freezing point to avoid the formation of ice crystals. Ice cream comes in tubs, in cones, in biscuit sandwiches, or on a stick. There are numerous varieties of ice cream such as gelato, sorbet, frozen yogurt, and frozen custard. Vegans and those who are lactose intolerant often opt for ice cream made from milk substitutes. A frozen dairy dessert is made with milk that does not contain butterfat. This means that the percentage of milk fat in its composition is below 10%. Frozen dairy desserts mainly contain vegetable oil such as palm kernel oil and coconut oil. It also has more “overrun,” which is the amount of air whipped into the substance to make it fluffier. Manufacturers claim they introduced frozen dairy desserts because of public demand for ice cream options with less fat and more flavor. So what is the difference between ice cream and a frozen dairy dessert? Both ice cream and frozen dairy desserts are sold in the same aisle at the supermarket. However, one is made with butterfat while the other is made with vegetable oil. According to the FDA, in order to be considered ice cream, a frozen dairy dessert must have at least 10% milk fat. The taste of frozen dairy desserts is not noticeably altered, although to achieve this, producers tend to put more corn syrup into frozen dairy desserts to give them more flavor. It is more profitable to make frozen dairy dessert with vegetable oil (selling it at the price of regular ice cream) than to make ice cream with butterfat. Packaging, pricing, and taste are the same between the two and people do not know the difference unless they look at the package and read “Frozen dairy dessert” instead of “Ice cream”.